Chad Perry’s experience with M.U.S.C.L.E. toys started as a birthday gift given to Karl Hermann. The 28-pack traveled from Meijer, to his home to be wrapped, arrived at Chuck E. Cheese to be opened, but ultimately remained burned into Chad’s consciousness. 4- and 10-packs were purchased during family grocery trips to Meijer, often the reward for doing chores at home or behaving during the grocery shopping. He didn’t remember ever receiving M.U.S.C.L.E. figures as a gift for any birthdays or holidays. 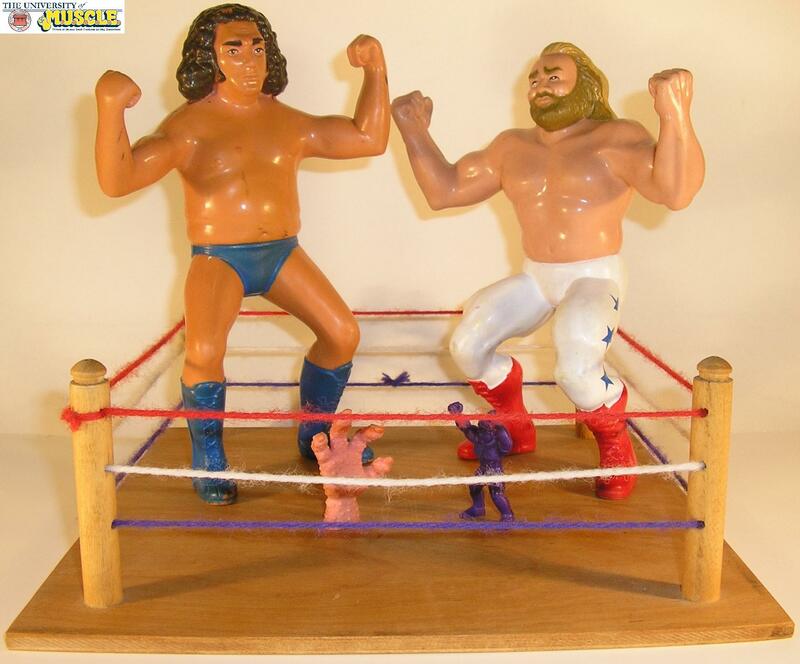 The allure of the figures was both the mysteriousness and the wrestling. Without the official Hard Knockin’ Ring Chad improvised with the only ring available to him, Tomy’s Bumbling Boxing. 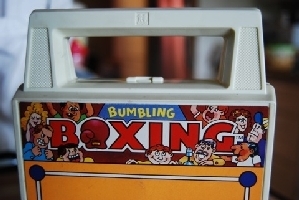 The insides of the ring were removed, which allowed the ring to double as a carrying case. His grandfather, also a wrestling fan, was surprised to see his grandson “playing wrestling” and set out to construct a better wrestling ring. Chad’s grandfather was a woodworking hobbyist and built the ring and posts out of wood. The ropes were red, white, and blue strings of yarn which fed through the wooden posts. Chad’s grandfather glowed with pride upon delivering the gift. Chad was forced to hide his disappointment. The ring was both too large for M.U.S.C.L.E. figures and too small for his LJN WWF figures. Chad’s time with M.U.S.C.L.E., like the brand itself, was relatively short lived. He purchased figures through the Flesh waves and some of the Color figures, but like most children his attention quickly shifted to other toys. 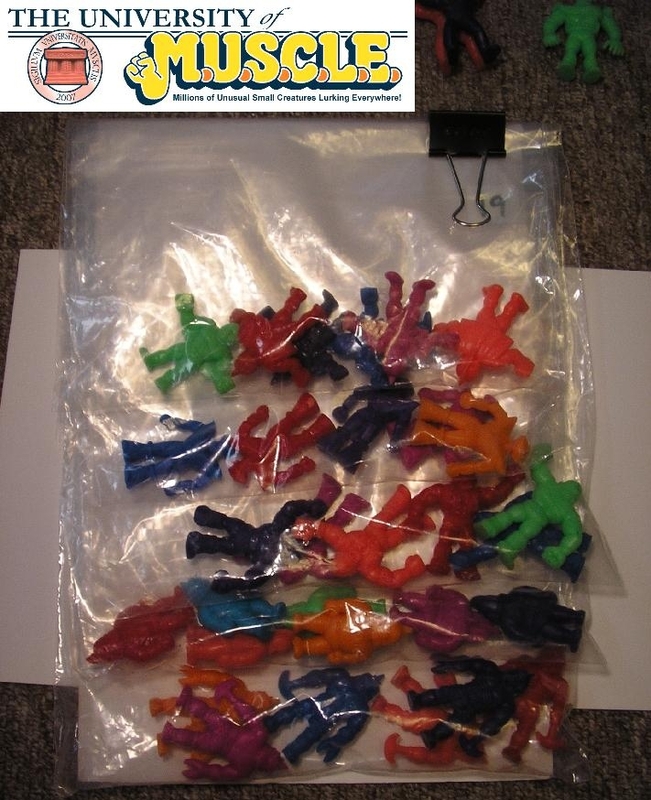 The figures were put into a bag, boxed up with other small figures, and relegated to his parents’ basement. There they sat, untouched, for roughly 15 years. Then in the fall of 2002 a wandering mind started thinking about some childhood toys and M.U.S.C.L.E. came to the forefront. A trip to his parents’ basement and a few internet searches rekindled his passion for the little figures. 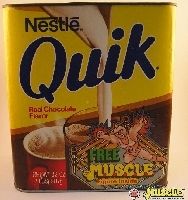 He first setout to collect an entire Flesh set, but his interest quickly turned to Color figures and the Nestle Quik promotion. These two areas have remained the focus of his collection. His favorite piece is the Nestle Quik tin. Having collected the M.U.S.C.L.E. figures since 2002 Chad has experienced a lot of M.U.S.C.L.E. growing pains. When he started, aside from the M.U.S.C.L.E. poster and MuscleUK, there were very few checklists and collecting resources. The first collection manager was simply his desktop where the figures were stood up. After a few eBay auctions he quickly realized he needed a more stable and user friendly version. The first thing he did was create a checklist, a checklist he still uses today – more for nostalgic reasons, but also as his absolute master list. Chad’s next collection tool was two foam boards with numbered baggies. This allowed him to both see which figures he needed and easily swap out dirty or damaged figures for more pristine figures. Once his Flesh set was complete his attention shifted to the Color figures. When he started collecting Color figures it was unknown which figures had been made into which colors. This led him to create an Excel spreadsheet to track his collection, which has gone through various edits and changes, but still continues to be used today. Once the list of Color figures he needed started to get smaller he created a few sheets with pictures of the figures, another process he still uses. He has also used his “Needs Thread” on LRG.com and the MUSCLEDB, but both of those are used simply out of routine more than necessity. With so many figures the actual storage became an issue. 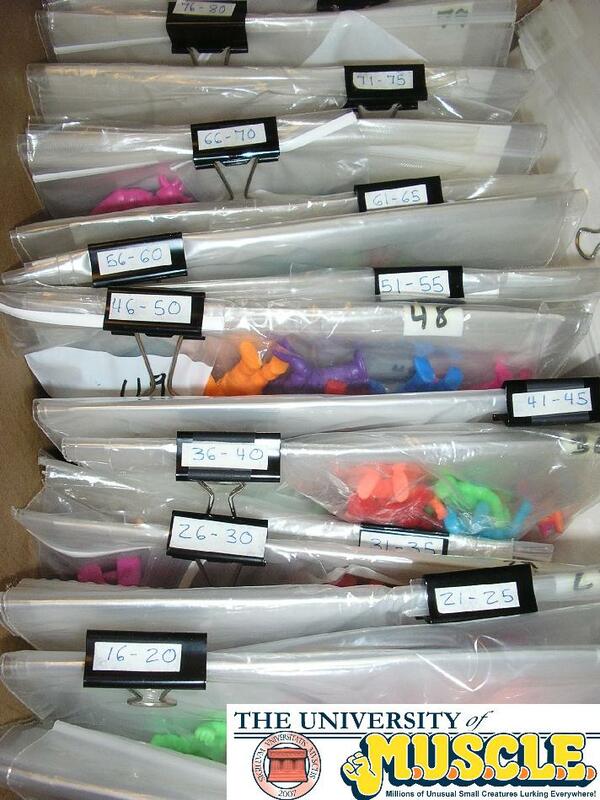 Chad needed an easy way to both store and organize the nearly 1500 figures. He settled on a numbered baggie system. 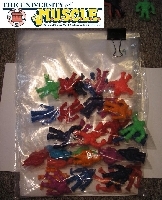 The figures were put into Ziploc bags, which were numbered and grouped into groups of five, clasped to comic book boards, and placed inside a long banker’s box. After a basement fire, the basement box was destroyed and the figures were placed into two cardboard boxes. 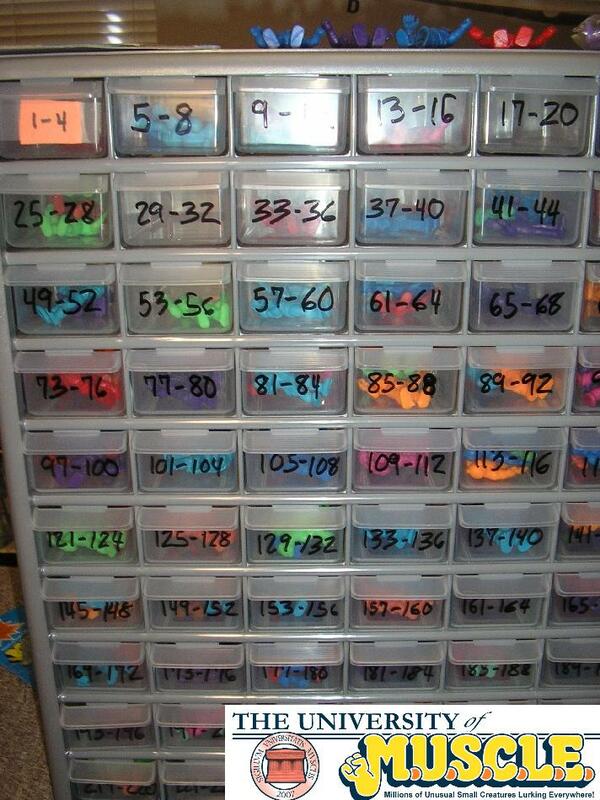 The storage system is not fancy but has allowed for easy organization which includes checking the condition of figures when there are doubles. Chad is not a stickler regarding a figure’s condition. He has always taken the approach that it is better to have a damaged figure instead of no figure. Patience has allowed him to replace most of his damaged figures, even figures that can be difficult to find. As his collection grew his family and friends confusion turned into interest. The “little guys” never earned much attention, other than confusion as to why he would collect them or spend money on them. The interest from family and friends came from Chad talking about the minutia of M.U.S.C.L.E. They were interested in the phone calls, interviews, and the information he was digging up. What had once been a one way discussion had become a topic in which family and friends would ask questions about M.U.S.C.L.E. and any new developments. Chad’s discussions are not limited to his friends and family. He has often been an outspoken voice in the M.U.S.C.L.E. community which has brought him seemingly equal amounts of supporters and detractors. At the core, his interest has always been to protect the M.U.S.C.L.E. community and communicate in an honest and direct way. Chad recently made some changes in his approach to the M.U.S.C.L.E. community, and wants to continue making changes. In his professional life he often instructs other to focus on what they can control instead of what they can’t control. This positive framing has led him to encourage participation in the community and to establish clear and specific M.U.S.C.L.E. data through the University of M.U.S.C.L.E. I have never understood the rush, or impatience, that many collectors feel. They want to quickly finish one collection so that they can begin the next one. When I learned that my wife and I were having a baby it finally solidified my marathon-like pace. There was no need to rush, because I was enjoying the journey much more than the ownership. A slow pace is out-of-step with American culture, but I think a slower pace makes M.U.S.C.L.E. collecting much more enjoyable. Everyone wishes they had more money, but M.U.S.C.L.E. is a hobby that doesn’t necessitate it. There have been several people over the years, and probably still some today, that are incredibly defensive about their spending. They should spend what ever they want – which is true, but it is not necessary. Just because you can buy a $25,000 sundae doesn’t mean that you should. I have seen collectors loose their mind because they “needed” something. I think there is an important distinction between want and need. That distinction is something that collectors often forget; remembering that distinction will help collectors keep their collecting under control. I also think Desire is sometimes fueled by emptiness in another aspect of a collectors’ life. After having two encounters with house fires and having my family come out unscathed, I have since never struggled with want and need as a collector. I think this plays an important role for both novice and experienced collectors. 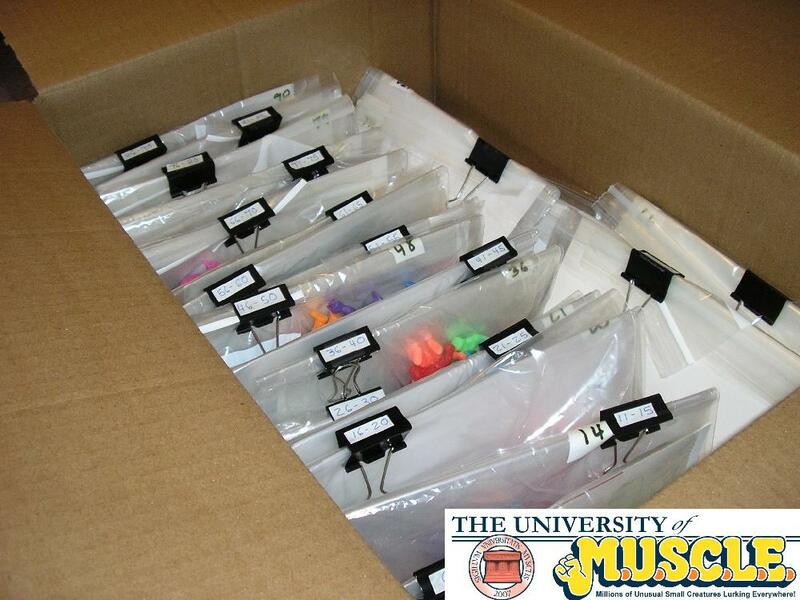 It helps collectors spend appropriately, but can also be a catalyst for learning about M.U.S.C.L.E. When more people are able to understand all the facts, then even more people are able to effectively hypothesize. With a comparatively small community M.U.S.C.L.E. needs all the strong minds it can collect. I think there was more competitiveness during the earlier days of M.U.S.C.L.E. collecting. Many collectors have shifted to a more cooperative mindset, however the competitiveness is still seen in newer collectors – especially on eBay. Most collectors have fallen victim to the perceived competitiveness of eBay at least once. Being able to recognize the silliness of the situation can help avoid any buyer’s remorse. – Nathan’s M.U.S.C.L.E. Page: This is the best possible introduction to M.U.S.C.L.E. an internet user can have. – LittleRubberGuys.com: There isn’t another message board in the world with as many M.U.S.C.L.E. collectors. It is also one of the best message boards in the world because of the users. – Soupie’s M.U.S.C.L.E. Color Image Archive: If a collector wants to see if a figure was made in a certain color or which part and tree they came from, then there is not a better place to check. – The M.U.S.C.L.E. Database: This site is only useful for tracking your personal collection. It has been misused and manipulated so the current data on many figures is misleading. It is currently 100% ineffective at gauging the rarity of a figure. I hope I can evolve to the point where my collections are simply things. I should spend all my time making memories instead of allowing things to trigger memories. This entry was posted on Friday, October 23rd, 2009 and is filed under Sociology, UofM News. You can follow any responses to this entry through RSS 2.0. Both comments and pings are currently closed.